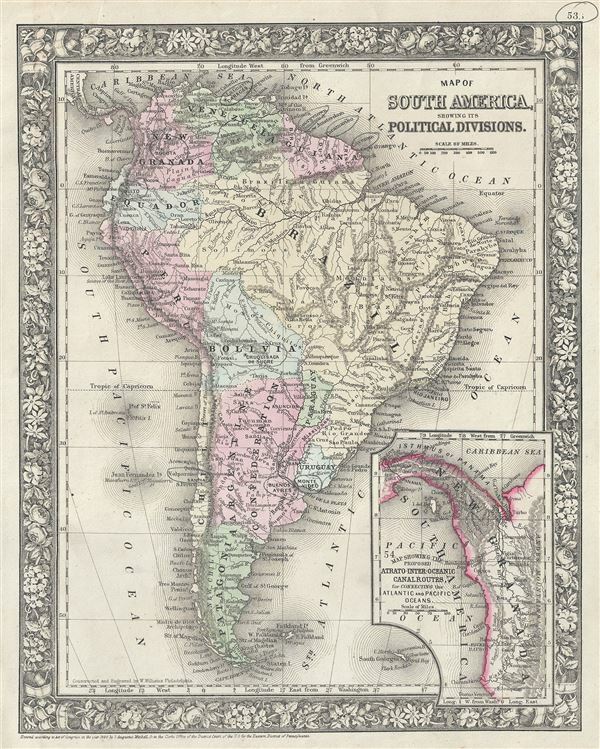 This is a fine example of the legendary American map publisher Samuel Augustus Mitchell Jr.'s 1866 map of South America. It depicts the whole continent from Panama to Cape Horn, it includes the Falkland and South Georgia island groups in considerable detail. Mitchell offers limited but surprisingly accurate detail of the interior of Brazil and the Amazon Basin. An inset map in the lower right quadrant depicts the Isthmus of Panama entitled 'Map Showing the Proposed Atrato-Inter-Oceanic Canal Routes, for Connecting the Atlantic and Pacific Oceans.' Work on the Panama Canal would begin in 1880 and be completed in 1914. Mitchell Jr., S. A., Mitchell's New General Atlas, Containing Maps Of The Various Countries Of The World, Plans Of Cities, Etc. Embraced In Forty-Seven Quarto Maps, Forming A Series Of Seventy-Six Maps And Plans, Together With Valuable Statistical Tables, 1866 edition. Very good. Minor spotting. Pencil marks over some cities, can be erased. Rumsey 0565.029 (1860 edition). Phillips (Atlases) 831-45. New York Public Library, Map Division, 1510824.